ItemBARK_1990.0003.0512 - Kong Sing on a horse on Barlow Avenue in Quesnel; circa 1910. 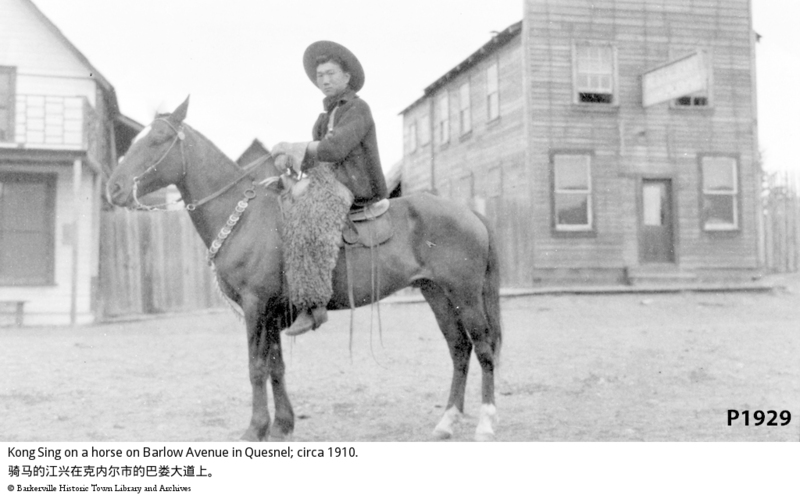 Item BARK_1990.0003.0512 - Kong Sing on a horse on Barlow Avenue in Quesnel; circa 1910. A Chinese man, Kong Sing, sitting on a horse for a portrait. The horse is standing broadside to photographer, on a street or road. The man is wearing a hat, open coat, long gloves with leather tassels, wooly chaps, boots. Behind the man is a two leveled building (business) with horizontal siding, and a fasle front. There is a sign on the second level perpendicular to building, but unable to read in negative form. These buildings are C.D. Hoy's General Store and Restaurant & Rooms. Identified as Kong Sing.